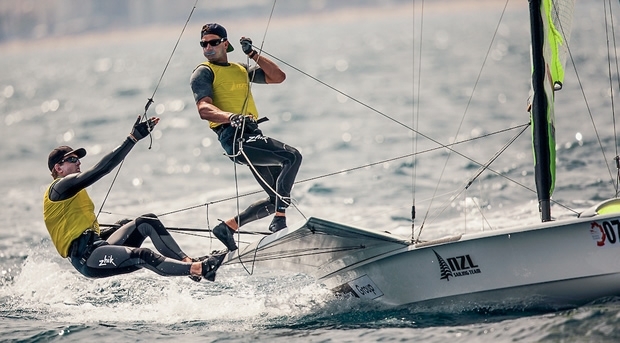 It was a scramble for both gold fleets on day 5 of the 49er and 49erFX European Championships as few teams managed consistency through the day due to the inconsistent winds. Back on shore, as teams discussed the racing, mostly befuddled, the old boys' coaches union brought out expressions like “Barcelona Banana” from the days of the 1992 Olympics, but ultimately most explanations of the conditions only served to explain what happened rather than predict what would happen next. Even with the shifts and puffs, or perhaps because of them, the windward marks were especially busy as 25 of the best skiff crews in the world arrived en masse. In the third race a pack of boats arrived simultaneously, with the bottom two boats pinching wildly to make the mark and stacking up the rest of the fleet. The day was an edgy one all around, and it didn’t matter if a team was at the front or the back of the pack: 100% concentration and patience was required as it was so unsettled. Now third overall, Nico Delle Karth and Niko Resch of Austria had the most consistency: “We wanted to commit to sides, as we felt the middle couldn’t work. Today it was possible to read the wind as there was enough cloud cover to see both sides of the course fairly, so we chose our side and had the legs to get there. It worked out as well as could be hoped,” said Resch. Delle Karth and Resch managed a 6, 4, 4 to move into third position overall. New Zealanders Logan Dunning Beck and Jack Simpson also managed to spot the pressure, but had more trouble executing. In the second race they just about got it perfectly however, “we thought we were going to grab a win, but the Italians pinched us right on the line. Was fun to get a good one in,” said Beck. Over on the 49erFX course it was the same story, with few teams mastering the conditions. The Argentinians, Travascio and Branz, along with Kiwis Maloney and Meech both had great days to move up into contention for the win. Even with the great day of results, Meech commented it didn’t feel that great. The Kiwi duo aren’t focusing on results too much, and that seems to be working as they’re within striking distance of medals in fourth overall. On top of both tables are the 2015 World Champions. Burling and Tuke are putting on another incredible display. Even with their blip in the second race they still managed to extend their monstrous lead by seven more points to 41. Outteridge and Jensen are getting back into the 49er rhythm after three straight weeks in the boat and sit reasonably comfortable in second with a 15 point gap behind them. On the 49erFX side, it’s Conti and Clapcich who are back in the lead. They didn’t have their best day, but did better than Echegoyen and Betanzos who slip to third after leading going into the day. With only 11 points separating the top thee the 49erFX course will be the one to watch on the final day. The 49er class has a fairly unique approach to the final day of racing. Scheduled is a monstrous three fleet races for each fleet and a medal race for each top 10 . The aim is to start both gold fleets at 10:00 am, race three races, then have the gold fleets head to shore for protests while the silver fleet get three races in. Finally, the aim is to send the top 10 boats out for a medal race to conclude the racing. It’s an ambitious schedule even if things go perfectly, but in a place like Barcelona that relies on a sea breeze, if the racing starts later in the day the schedule must be reduced. The intentions were made clear to the fleet that fleet racing will be the priority over medal racing, and the aim to get some silver fleet racing in, if possible, even if it means cutting the gold fleet to two, or even one race if the wind is particularly late. The Notice of Race restricts fleet racing to 16:00 and medal racing to 17:00, and teams will be updated on the racing intentions via radio throughout the day.